In the past this fundraiser evening has been titled “An Armchair Travel Evening”. There was nothing armchair about fellow villagers Bryn and Emma Parry’s ambitious cycle ride through provincial France. The 90-strong audience felt Emma’s pain as they watched the film of her gasping her way up yet another “little hill” – Bryn’s description of the steep gradient to be tackled. Someonehad failed to bring a contour map on the ride. 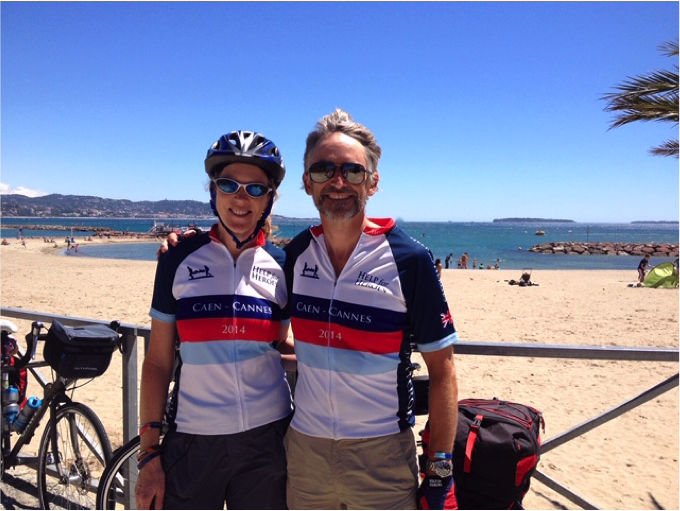 The husband and wife founders of the charity Help for Heroes embarked on this cycle ride in 2014 after Emma (the cyclist in the family) had dreamt up the idea in 2007…then a little charity rather took over their time…. They did the ride to raise money for H4H …dedication to the cause. From the flat straights of Normandy through the “hilly” terrain of the Auvergne, to the Tour de France area around the Mont Ventoux, the breath taking Gorge de Nesque in the Luberon, before finally heading down to the most dangerous part of the 2 week cycle…the streets of Cannes. Here they defied death: taxis, lorries, pedestrians, even other cyclists. The peace of the back roads of the vast French countryside meant they were unprepared for the city bustle of the final kilometre. Cartoonist Bryn, and local B&B host Emma, crafted the evening seamlessly as a team, interviewing each other across the floor. Truly professional – but it was all done unrehearsed! In character with the evening, French bread, cheese, grapes and wine were served to everyone (with less French Brownies and lemon drizzle cake as dessert). The evening made approximately £1680 profit for the Moot.